Calling all Hot Weather Runners!!! I have found the race for you – the Buffalo Stampede! The Buffalo Stampede takes place every July in the tiny town of Wyoming – also known as “the Best Little Town in Delaware”. The race starts and finishes at beautiful Wyoming Park. You will run through Fifers Orchards with a course will take you along rural country roads. A local running and cycling group, the Downstate Delaware Striders and Riders, goes all out for this race, which offers both a 5k and 10k option. This year they are hosting their 37th annual race. Just so you know a little history behind the race, the race was started by a group of runners that had just returned from a run from Wyoming to Marydel and back. They stood outside Brownie’s tavern, rehydrating with God’s most perfect food – beer. One of the original organizers, Jack Croft, said “You know, the best road races end at taverns, like Falmouth”. And with those words, the Great Wyoming Stampede was born. The name “Buffalo Stampede” stems from original sponsor Frank DiMondi, who owned a herd of buffalo and agreed to be an early sponsor. The group immediately saw an image of a race through orchards and Amish countryside – ending at a historic tavern in a historic railroad town matching the western images of Wyoming and buffalo. So why run the race in July you ask? The group of runners came up with the idea in June and decided to schedule the race the next month. Frank Janni, a friend of Frank DiMondi, was the adjutant general of the Delaware National Guard and brought 60 of his troops the first year to assure there would be an adequate field in a race to be held in just a few weeks from inception. Let’s talk post-race party. The Buffalo Stampede definitely has an amazing post-race party. 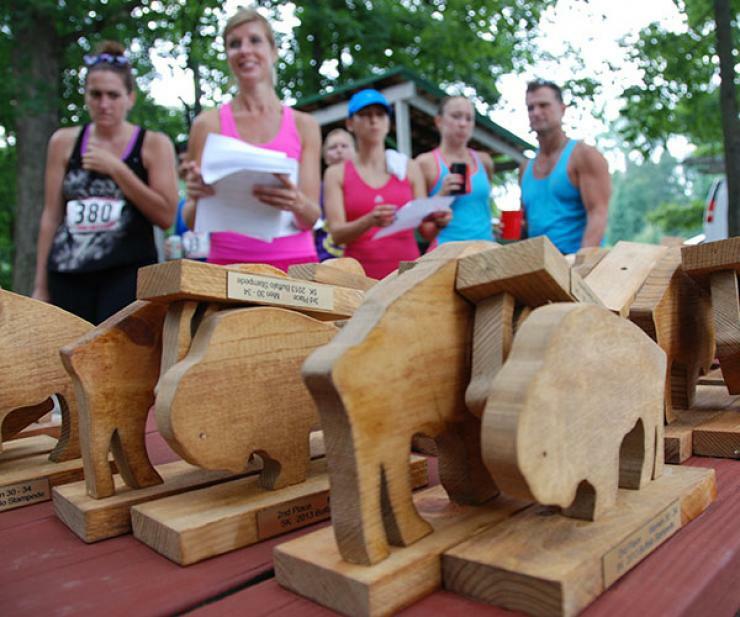 This year, runners have several things to look forward to: BEER, music by the Glass Onion Band, and homemade buffalo trophies! What else could you ask for! There is also plenty of shaded area at the Moose Lodge in Camden to enjoy the post-race festivities and no limit on beer until the kegs run dry! Umm yeah, that sounds like my kind of post-race party! Runner’s World recently featured the Buffalo Stampede as 1 of 18 5K’s you should do to fill your race calendar. If you are looking for a local race to do this weekend, look no further! Check out the Buffalo Stampede Saturday July 18th at 8 am! I hope to see you there!